Arjan Tien (conductor); Wouterina van de Merwe, M. Nieuwenhuis (flute); Bart van Tienen (woodwind); Koen van der Leeuw, W. van den Broek, Wouter van den Broek (hobo); Annemiek de Bruin, Bas van der Sterren, Daan Kuiper, Ilse Jongen, Joep Hoefsloot, Joris Lumeij, Leon Zwijgers, Linda Schellingerhout, Madeleine den Braven, Marlou van der Schoot, Nanda Meering, Peter Bongaerts, Robin Loff, Roger Palmen, Ton Kerstholt (clarinet); Jean Pierre Cnoops, Rene Hendrickx (alt sax); Sander Looymans (tenor saxophone); Wout Claessens (baritone saxophone); A. Hill, N. van de Merwe (fagot); Eric Vloeimans, Jeroen Schippers, Johannes Vloeimans, John Curfs, Marcel Jungen, Max Schrader, Monique de Rooij, Olaf Schipper (trumpet); Frank Kramer, J. van de Heuvel, Magda van der Kooi, Nick Caris (trombone); Rommert Groenhof (bass trombone); A. van der Merwe, Harry Stens, M. Mulder, Sebastiaan Hettema (horn); Gerrit Hendrik Wensink, Meli Renato, R. Meli, R. Mulders, Rodin Rosendahl (euphonium); F van Altena, Hans de Wilde, Harm Vuijk (bass tuba); C. Knegjens, Ron Cuijpers (piano); Laurens Knoop (bass, contrabass); Arjan van der Dussen (drums); Niels Jenster, Richard Dols, Sander Simons (percussion). 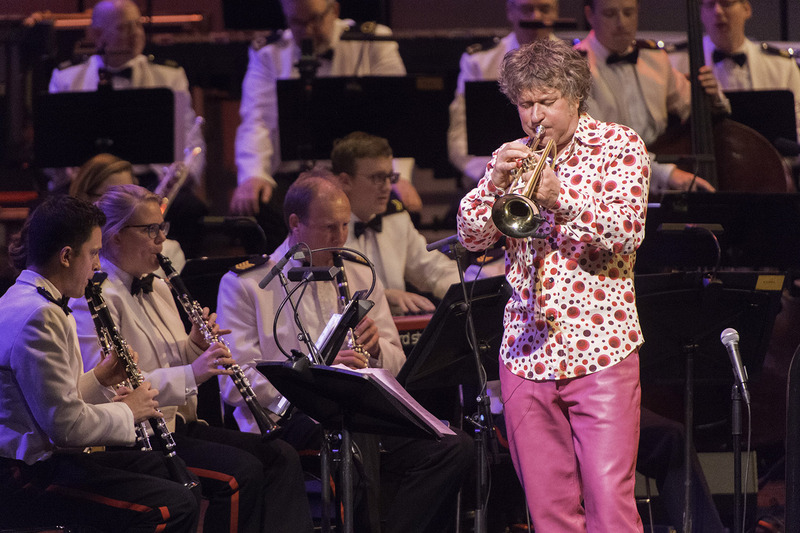 Trumpeter Eric Vloeimans and the renowned Marine Band of the Royal Netherlands Navy have been performing at venues in the Netherlands for the past two years. That turned out to be a huge success. A love of marching bands is deeply rooted in Vloeimans' youth. As a child, he played in a marching band in full uniform and it was there that he learned to read music and conduct. Vloeimans and the Marine Band first played together in 2010 at the Rotterdam concert hall the Doelen. A year later they performed at the Concertgebouw in Amsterdam. The band and Vloeimans both play all over the world and they will bring these influences with them when they perform at North Sea Jazz Festival: everything from eastern European folk to hip lounge music. You will hear it all in the concert of these two giants that is aptly titled Around The World. Arjan Tien is the musical leader of this wonderful program.